Yesterday the Ultra Low Emission Zone, or ULEZ, came into operation in central London, aimed at curbing exorbitantly high levels of urban pollution. If you'd like to read a serious article about the zone, how we got it and what it builds on, I can heartily recommend this post by London Reconnections. Or you can watch some proper BBC London reportage on Tom Edwards' YouTube channel. I merely went for a walk around the outside of it, which is a mostly pointless activity, and undeniably bad for one's health. I did however get some good photos of the new signs. The ULEZ covers the same area as the Congestion Charge Zone, introduced in 2003, so hasn't cost a huge amount to implement. All the cameras and payment mechanisms are already in place, so all that's had to go up are new green signs alongside the old red ones. 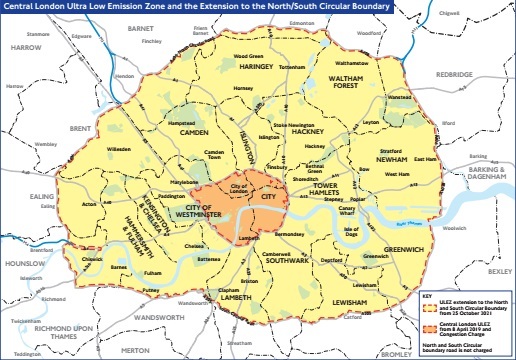 The ULEZ covers the same area as the Congestion Charge Zone, and is targeted at users of high polluting vehicles. A daily charge is applied for driving inside the zone, and diesels bear the brunt. So a 13 year-old petrol-driven car pays nothing, but a 3 year-old diesel-driven van pays full whack. For cars, vans and motorbikes the daily charge is £12.50. For lorries, coaches and larger vehicles it's a whopping £100. The fine for not paying promptly is £160 for smaller vehicles and £1000 for larger vehicles. The fine is halved if paid within 14 days. 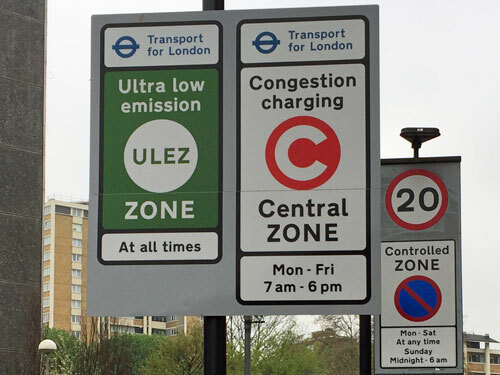 The ULEZ applies 24 hours a day, whereas the Congestion Charge only applies between 7am and 6pm on weekdays. Vehicles get to pay both. For daytime drivers that's £12.50 on top of the existing £11.50, i.e. £24 a day. Could be £120 a week, i.e. £6000 a year. This is why your Uber fare has gone up. Cutting noxious emissions is undeniably the right thing to do, whatever the individual cost. 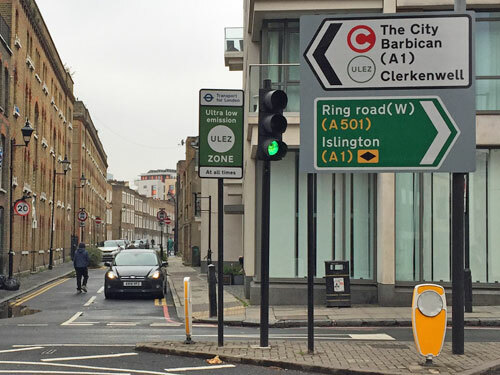 But all the signs I saw around the Congestion Charge boundary are only temporary, and the next stage of the project could prove a lot more controversial. In October 2021 the ULEZ will be expanding to cover the whole of London inside the North and South Circular Roads, which'll bring millions more people into its financial remit. Every time you drive a non-compliant vehicle within this extended zone, it'll cost. A trip to the shops, a drive to see gran, the school run, they'll all set you back £12.50 a day. The entirety of Westminster, Kensington & Chelsea, Hammersmith & Fulham, Camden, Haringey, Islington, Hackney, Newham, Tower Hamlets and the City of London will be covered. Thanks to geography no south London borough will be affected in its entirety (although Southwark almost is). That's still a lot of votes to lose. Backstreet residents in Bowes Park, Beckton, Barnes and Blackheath are going to have to stump up, or change their cars. This is of course the intention, or better still to nudge people to switch to walking, car clubs and public transport. But for the less well-off with a second-hand diesel parked out front, with limited resale value and only 30 months to make a difference, it's going to be a whopping shock. 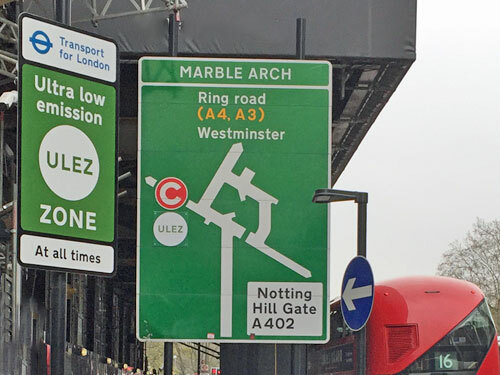 As for cameras, it's all very well having them at entrances to the Congestion Charge zone, but the North and South Circulars are on a totally different scale. It would be prohibitively expensive to install CCTV at every junction on the new perimeter, especially in South London where the road's not dualled. But it's scarier than that - the ULEZ also needs to capture every significant vehicle movement within the intervening 150 square miles, which potentially requires Big Brother levels of surveillance. We know the Met Police have cameras all over the city to keep tabs on vehicles of interest as required. What's intriguing is that data from this covert network might soon be used, in conjunction with additional cameras as necessary, to confirm ULEZ status and pass on details for daily charging. Twenty years ago this couldn't have been done, but we now live in an era where transport surveillance is commonplace, indeed widely accepted, and being used to discourage high-polluting journeys. You can imagine suburban car owners experimenting to find a route to the shops that the cameras don't capture. You can imagine drivers choosing not to fill up with petrol on Thursday if they won't be driving anywhere else until Friday. You can imagine Auntie Jean choosing not to pop down and visit her relatives in Cricklewood because she doesn't understand how the system works, or failing to realise she needed to pay and being whacked with a £160 fine she's unaware of. It may be just as well that the implementation date for the extended ULEZ is safely beyond the date of the next mayoral election. I live within the extended zone but I don't drive, I only breathe, so I'm more than happy to see this groundbreaking scheme rolled out further. What's more I've been living on a main road for years, long before vehicle emission standards improved, so must have been doing my lungs no favours every single time I went out. The price of limiting this invisible killer is high, but surely worthwhile for the health of Londoners of all ages. And maybe one day a walk round the edge of the Congestion Zone will be a sightseeing pleasure, not a bloody stupid life-limiting thing to do.